Cut deep crosses in the duck’s skin, slightly incise the other sides of the duck fillets to allow the fillets to cook more regularly. 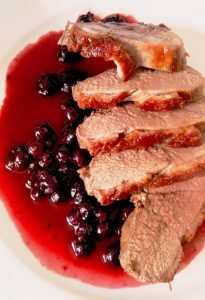 For the sauce, bring the red wine and duck stock to a boil and reduce to half, add the blackcurrants and simmer for 5 minutes. Then add the blackcurrant liqueur, verify the seasoning, set aside and keep warm. Season the fillets with salt and pepper, then sauté with the skinny side down first, cover and reduce the heat after 4 minutes. Turn the fillets regularly for 8 minutes, set aside for resting and keep warm for 5 minutes. Slice the fillets, decorate four plates with the sauce, arrange the fillets on them. Serve with mashed potatoes and Pinot Noir red wine.